To start the game you must create a character by picking a portrait, chasing a color affinity, assigning ability points, naming the character and selecting a difficulty level. 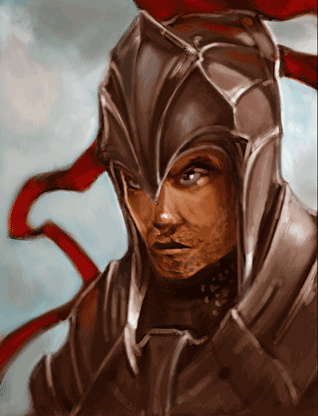 There are a number of portraits available to chose representing various races and sexes. You must chose a color affinity, which can be red, blue, green or black. This determines the border color for your player and you gain an extra starting aeon of that color to start each duel. This also determines your card back and your starting deck, which will be made up of cards of that color. A player has four abilities: Health, Agility, Wisdom and Intellect, that affect your game play in different ways. Each ability starts with a value of 8. When you create the character you have 10 points to distribute to these four abilities as you see fit. You can also use a Random button to distribute them randomly. A Reset button is also provided to allow you to redistribute those 10 points. You can name the player whatever you want up to a limit of what will fit on the player card. Easy – Enemies have lowered ability scores. When you lose a duel, you lose gold, but not cards from your deck. Great job on this! would love to see a PVP mode at some point, trading, more cards! Ex Magic and Hearthstone player and LOVING this so far…ill buy the expansion as soon as I am done w first one. Thanks, glad you are enjoying Lost Portal! I am currently working on a second expansion with more new cards and enemies! I don’t expect to add PvP as Lost Portal was designed from the beginning as a single player experience. Any chance in Next expansion we can have some sort of infinite play area? Test decks w large scale (end game) collection? Currently, you need to start over and collect again to try out new colors. Etc. Also – Thanks for the hard work! Take my money please when expansion comes. Some fun cards to abuse that’s for sure. After you complete the main campaign, there is a new quest that unlocks in Coradym. That quest allows you to retrieve the Ancient Portal, which can take you to some new areas that have random dungeons with upgraded versions of all the enemies you’ve faced so far. You can go through that portal over and over, trying out new decks with your massive collection of cards. I am making good progress on the new expansion, which will have 40 new cards in total, including new enemies and bosses along with their Avatar cards. I just implemented a new creature ability called Empower that increases the damage dealt by your destruction spells. I’m having fun testing it!